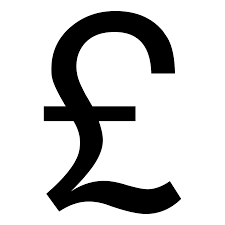 Do we use strike-throughs only because they make currency symbols easier to distinguish from other letters of the alphabet, even when the sign is written in an old-fashioned style like the pound symbol? Wouldn’t it be safer to invent a totally new symbol, rather than re-using a letter as @Rad Lexus pointed out? 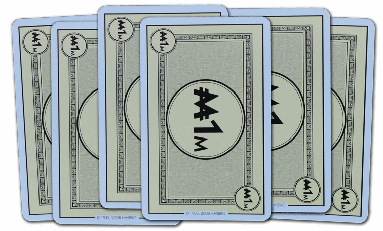 As a side note: I wonder if we can also assume that strikeouts in currency symbols have become a "pseudo standard", because even Monopoly uses them to associate real money with game money? Edit I: As @Zach Saucier mentioned a (very) similar question was asked on quora.com. Unfortunately the answer provided there is IMHO not very satisfying, since only the (hypothetical) history of some major currency symbols is posted there and not any explanation why strikeouts are used in general for currency signs. 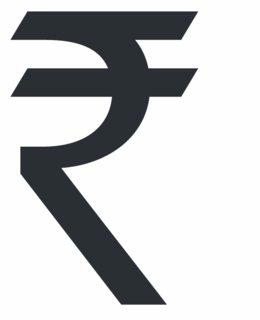 It's clear that the designers of more recent currency symbols have their own rationale for including the slashes or 'strikeouts' in the symbol. It's also clear that these elements naturally evolved in older currency symbols through the use of abbreviation and shorthand. 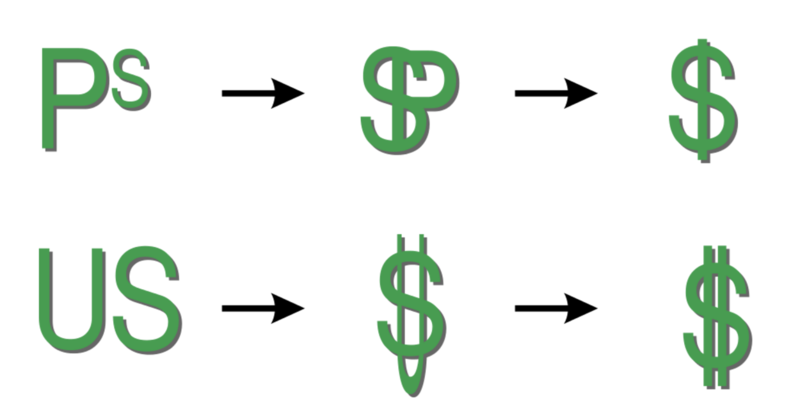 It's more than likely that modern currency symbols are using this older convention, that originally evolved naturally, that slashes through a symbol indicate currency. This makes it much easier to distinguish from regular characters. As you said in your question, the practice has arguably become a pseudo-standard. 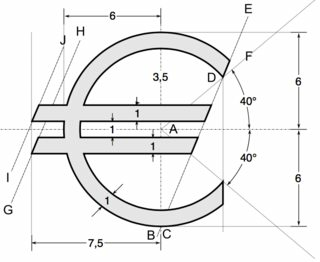 Inspiration for the € symbol itself came from the Greek epsilon (Є) – a reference to the cradle of European civilisation – and the first letter of the word Europe, crossed by two parallel lines to ‘certify’ the stability of the euro. The use of Shiro Rekha (the horizontal top line) in Devanagari script is unique to India. Devanagari script is the only script where letters hang from the top line and does not sit on a baseline. The symbol preserves this unique and essential feature of our Indian script which is not seen in any other scripts in the world. The two horizontal lines with an equal negative white space (imaginary space) between them create a foreground and background effect of three strips (tricolor). The strips subtly represent the tricolor of our Indian national flag flying at the top. The horizontal lines also denote the arithmetic sign ‘equal to’. [...] The arithmetic sign denotes that relationship of comparison of currency values. The equality sign also signifies a balanced economy, our economy should be secured and stable forever. 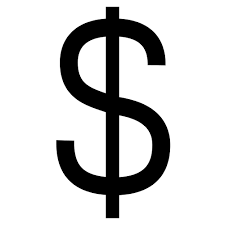 The origins of the Dollar symbol are somewhat more debated than more recent symbols. It originated when English Americans were trading with Spanish Americans in the 1770s. The most credible theory is that it is derives from the abbreviation 'ps' for the Peso. Another theory is that the symbol originated as an '8' with a slash through it—denoting Pieces of eight or the Spanish dollar. Theories for the origins of the dollar using two vertical lines include the idea that it originated as the abbreviation 'US' or as a representation of the Spanish coat of arms, which showed the Pillars of Hercules with a banner curling between them. The Pound symbol is more obviously derived from a cursive majuscule 'L', which represented 'libra', the basic unit of weight in the Roman Empire. The slash[es] through the Pound come from scribal abbreviations which were in common use in the Roman Empire and using shorthand became common around this time. The lines across currency symbols make them easier to identify clearly in handwritten documents. An error in the identification of even one alphanumeric character or symbol in a handwritten document can result in a very costly mistake or a lawsuit. Clear, unambiguous documents are also harder to forge. Having rational rules for currency symbols promotes public confidence in the government similar to the way that impressive looking government buildings in the capital city do. Aesthetic considerations must be harnessed to the other objectives of the design as in L'Enfant's design of the layout of the streets of Washington, D.C. as a system of intersecting diagonal avenues superimposed over a grid system, the L'Enfant Plan. The use of an alphabetical character as a mnemonic device in many currency symbols makes them easier to identify and remember. Not the answer you're looking for? Browse other questions tagged typography symbols history or ask your own question. Do the fonts Bebas Neue and Klinic Slab pair well? Can a logo have two symbols? What are the symmetry-in-pair symbols usually appear in Wingdings fonts? Why do some rare old printed manuscripts have mixed cases?